Noam Chomsky. Wikicommons/ Andrew Rusk from Toronto, Canada. Some rights reserved. Hello Wolfgang. I wondered where you went after our brief exchange following my articIe. I had just shown how you misrepresented your own book, and was waiting for some kind of response from you. ... crickets... Rather, I find you over in another corner of openDemocracy with a brace of new misrepresentations, centring on the claim that I am part of a dogpile on Noam Chomsky, led by Chris Knight and including Frederick J. Newmeyer, David Golumbia, and Lev Levidow. I won't catalogue all your misrepresentations, but let's be clear that those on your list are not marching in lockstep under Knight's flag. Newmeyer and I explicitly reject Knight's argument – to wit, that Chomsky designed his linguistic theories so as to make them unusable by the military for such things as command-and-control missile systems. We both offer plenty of evidence that undermines (in my case) or completely rejects (in Newmeyer's case) Knight's claims. That's the whole point of our commentaries. They were invited as responses to Knight's piece, and they both come out against it. Newmeyer and I are, by the way, with Chomsky on this, who has firmly rejected Knight's argument. As for Golumbia, he is at best ambivalent about Knight's major claim. But his position in your enemies' list is equally questionable. In fact, if read correctly his commentary is barely about Chomsky at all, in the sense of his motivations, his biography, his practices, his demeanor, and so on; Golumbia mentions in passing that Chomsky and his defenders react harshly to criticism about military funding, a simple fact. But that's it. Golumbia's commentary is overwhelmingly about the early reception of Chomsky's linguistics, about how the Cold War academy embraced Chomsky's turn to abstraction and idealization, not about Chomsky himself. That leaves Levidow, who indeed marches with Knight, but whose commentary clearly reveals the fault lines in your grouping, since he is defending Knight against my critique. Knight, for his part, mounts a defense against me and Newmeyer in a second article. You read these commentaries, right Wolfgang? How on earth did you come away with the impression of some Knight-inspired attack against Chomsky? In fact, even Knight does not attack Chomsky. 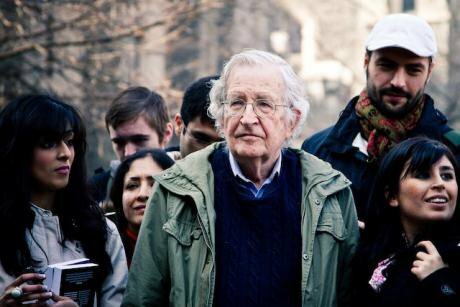 His commentary makes clear that he is just as opposed to the US military and American imperialism as Chomsky is, and, if anything, it is a point of admiration for Knight that (in his view) Chomsky made his linguistic theories inaccessible to their war machines. To be precise, I only say one thing 'against' Chomsky, that he is unreliable as a source for his own intellectual history. Since so many people, with you as Exhibit A, respond to such suggestions with hostility and bluster, I tried to inoculate the observation by documenting it carefully. So, I chose to show how outrageously untethered from veridicality is Chomsky's bizarre defamation of his supervisor, the eminent Zellig S. Harris (no relation). Chomsky is quoted in Robert Barsky's biography of him as saying that Harris never read his undergraduate, masters, or doctoral theses – on all of which Harris was the supervisor of record, on the first two of which Harris supplied the data, and the last of which featured Harris's most famous innovation, the Transformation. Chomsky repeated this claim to John Goldsmith, and apparently said much the same thing to you, since you repeat the charge in your book (but then backpedal in your response to me). Chomsky's claim about his supervisor is extraordinarily difficult to countenance; hence, my remarks about Chomsky's unreliability. It is also, of course, extraordinarily irresponsible – not a "heinous crime," Wolfgang, but certainly disagreeable. It is a charge of gross professional misconduct, something for which there are no other indications at all in Harris's career; quite the contrary. Harris signed all of these theses to indicate his approval, or Chomsky would never have received his degrees. I see no reason not to take those signatures as intended: Harris' public attestation that he did in fact responsibly read the theses Chomsky says he ignored. But those signatures are only a sliver of the public record on this question. There are many written statements by Harris, and equally by Chomsky, which wholly contradict the charge. I include a few of these in my article, but here's another one, from the preface to Chomsky's PhD dissertation: "This study was carried out in close collaboration with Zellig Harris, to whom I am indebted for many of the fundamental underlying ideas." Really, the claim is just so utterly reckless and so flagrantly at odds with the record that it beggars belief. I admit that what it says about Chomsky is not flattering, but I merely document the facts of the case. I draw no other conclusions from those facts other than that what Chomsky says about his own intellectual biography is not reliable. Apparently that's enough to earn me a place in your Knight-inspired, anti-Chomskyan dogpile. Some critical thinking advice now, while I have you on the line, Wolfgang. Try reading all of the relevant articles, substituting the name John Smith for the name Noam Chomsky and see if you have the same visceral reaction that everyone is out to get the beleaguered Smith, or if it is just an exchange of facts and opinions about a major contributor to the intellectual life of the last sixty years, an exchange in which only one colloquist is overwrought, you.